We eat kale enchiladas often. To complete the meal, I make a side of Quick and Easy Mexican Rice and refried black beans. Inevitably, we have leftovers. 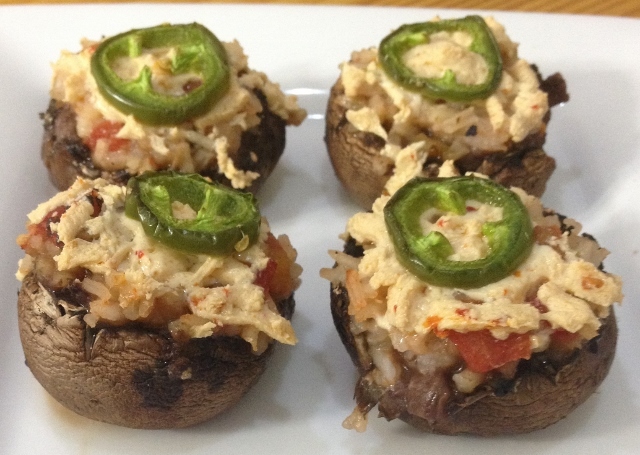 My favorite way to use up the last of the leftovers: Mexican Stuffed Mushrooms. 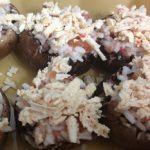 When I think of stuffed mushrooms, my thoughts go to cheesy, bread crumb topped concoctions. These have just a bit of cheese and no bread crumbs. 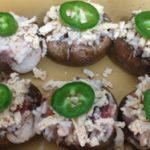 Interestingly enough, the baby bella mushrooms take on a very meaty texture after being baked, so it’s almost like having steak with Mexican side dishes. Super delicious and easy to make! 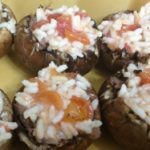 I was recently doing a little research on mushrooms (what can I say, total food nerd) and discovered that what we call baby bellas are actually crimini mushrooms. 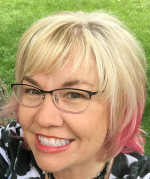 I thought I would share that in case you have trouble locating them by one or the other name at your local market. When grown to full size, these are called portobellos so baby bella seems acceptable, but crimini is the proper name. When you buy these mushrooms at the store, keep them in the refrigerator in a paper bag (avoid plastic). You can rinse them under water before using, but don’t soak them. Some prefer just wiping mushrooms clean with a damp towel. Preheat oven to 350 degrees. Set aside a small baking dish, 8 x 8 or so. Thinly slice jalapenos so you have 8 slices. Either rinse or wipe mushrooms off with a damp towel. Remove stems, saving for another dish or to make your own vegetable stock. Using a spoon, gently scrape the inside of the mushroom to remove the gills. Spoon one heaping teaspoon of refried beans into each of the mushrooms. Atop the beans, gently add a heaping teaspoon of rice, gently pressing down into the beans. 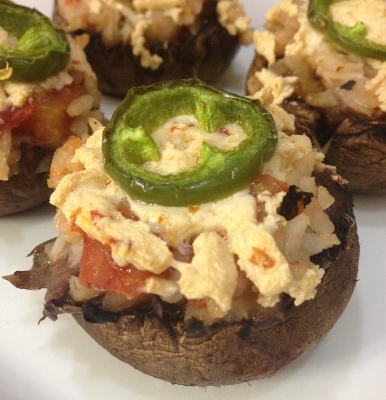 Top each mushroom with a sprinkle of cheese and a slice of fresh jalapeno. Bake at 350 degrees for 25-30 minutes, until mushrooms have softened and filling is hot. « Soften Saturday: Envious or Jealous? 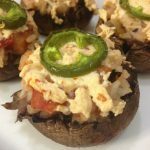 This recipe makes me want to eat mushrooms!! They sound like a perfect pop-in-your-mouth treat. Thanks, Ricki. They are perfectly sized for popping!